On Broadway, she was a Ziegfeld Follies girl and successful ingénue, enough so to have Hollywood take notice. 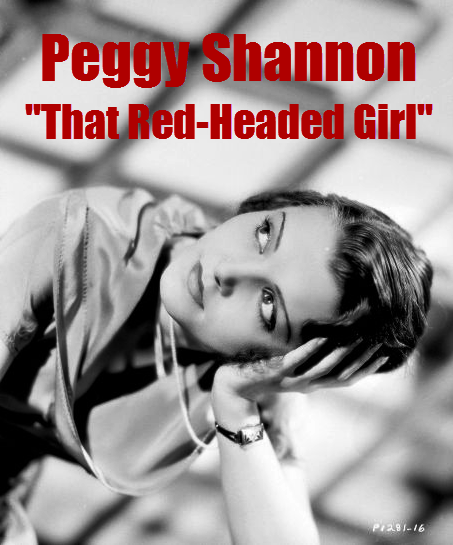 Once considered the successor to Clara Bow, the titian-haired Peggy Shannon, a pretty actress whose appearances in major roles gave her the potential for stardom, ended her life in heartbreaking loneliness. 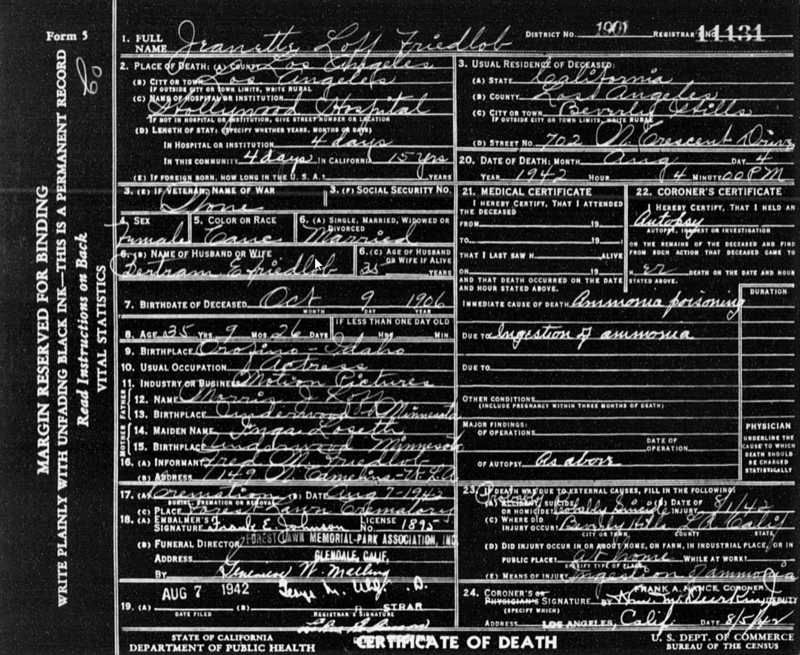 Peggy Shannon was born Winona Sammon on January 10, 1910 in Pine Bluff, Arkansas. As a child, her interest in music led her to study the piano and violin. She hoped to be a teacher until Madge Evans came to Pine Bluff on a tour promoting her line of hats. “I was only about 10 and knew then I wanted to be in show business,” Peggy recalled. 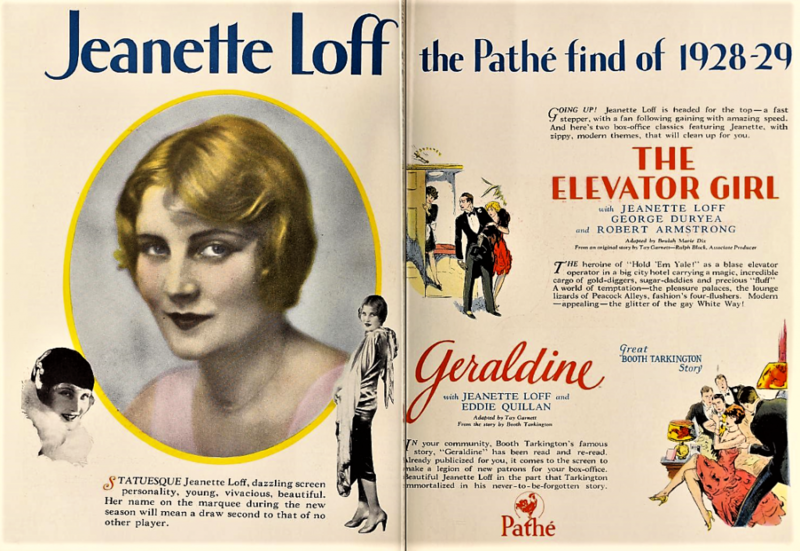 In 1924, her mother Nancy took her and her sister Carole to visit their aunt in New York, who happened to live in the same building as Goldie Glough, the secretary of Florenz Ziegfeld, who was preparing a new Follies show. 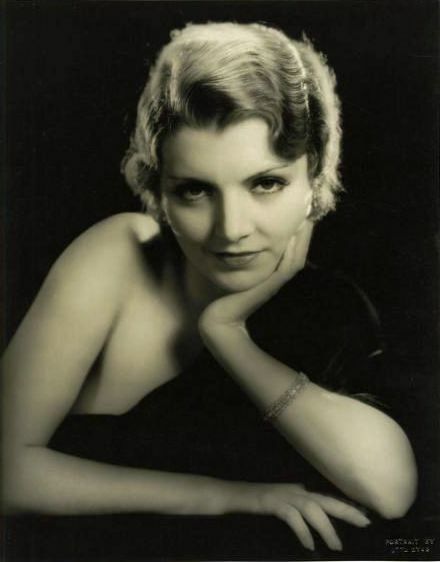 Goldie told Will Page, a press agent for Ziegfeld, about Peggy’s beauty and he had her pose for publicity pictures with Ziegfeld. She appeared in The Ziegfeld Follies of 1924, along with Will Rogers, Lupino Lane and Mary Nolan (also buried at Hollywood Forever). 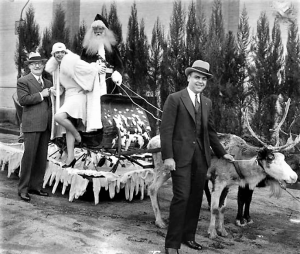 After one season, Earl Carroll hired her for his Vanities of 1925. She kept busy during this time, modeling during the day, then after appearing in the Vanities she joined the floor shows at Texas Guinan’s. In 1926 Peggy married actor Alan Davis. 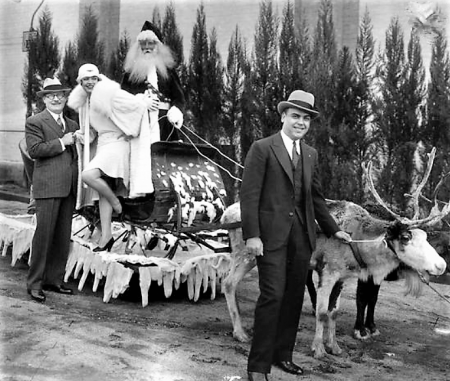 The following year Earl Carroll put her in the ingénue lead in What Anne Brought Home opposite William Hanly and Mayo Methot. For the next three years she appeared in comedic roles for William Brady, a noted producer who planned to make her a star. That would all change when B.P. 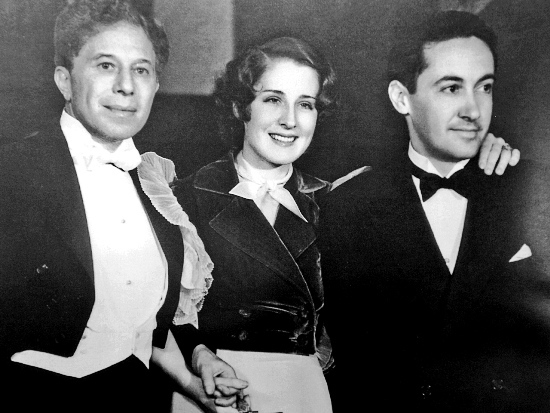 Schulberg, the head of production at Paramount saw her in Napi on Broadway and signed her to a contract. It was during this time that Paramount was recruiting many Broadway actors for film, including Sylvia Sidney, Claudette Colbert and Miriam Hopkins. 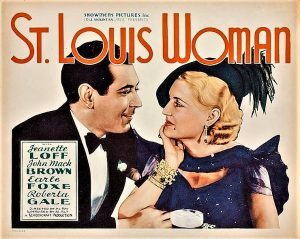 Peggy made four more films for Paramount and a few independent films, including False Faces (1932) in which she had some good scenes with Lowell Sherman. Leaving Paramount, she signed a contract with Fox in February 1932 and appeared as a nightclub singer in The Painted Woman (1932), opposite Spencer Tracy. She was billed as Tracy’s first romantic lead. The New York Sun reported that Peggy was “improving” but Fox executives disagreed and dropped her option. She worked as an independent in such films as Girl Missing (1933), directed by Robert Florey and Turn Back the Clock (1933) with Lee Tracy. 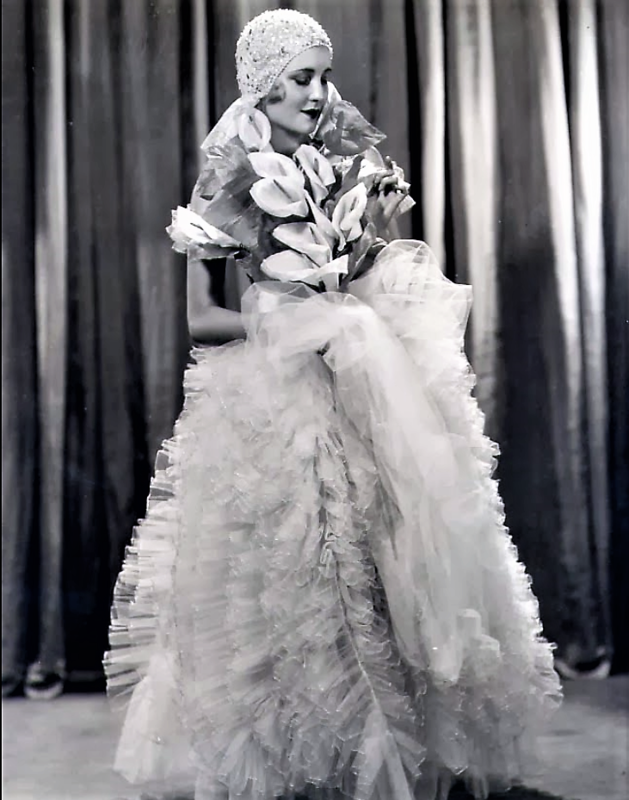 Peggy’s career was beginning to lag and second rate films followed such as Fury of the Jungle (1933), The Back Page (1934) and The Fighting Lady (1935). In late 1934, Peggy decided to return to Broadway in Page Miss Glory with newcomer, James Stewart. “James Stewart and Peggy Shannon are amusing as one of the bums and his fiancée,” wrote the New York Evening Post. 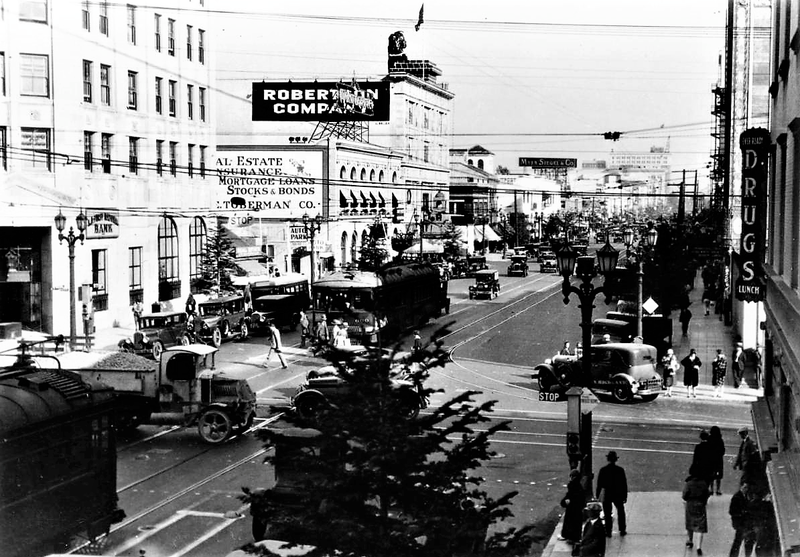 Then it was back to Hollywood and Universal where Lowell Sherman directed her in the lavish production of Night Life of the Gods (1935). Next it was off to Warner Brothers in the Perry Mason who-done-it, The Case of the Lucky Legs (1935). Still not happy, Peggy returned once again to the stage to do The Light Behind the Shadow. Unfortunately Peggy was replaced early in production, reportedly due to a tooth infection but rumors were that it was due to her drinking, a habit she was quickly developing. 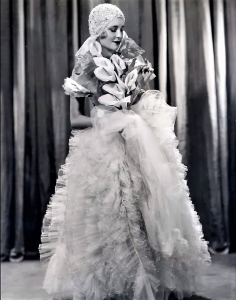 After another failure on Broadway, Peggy reported to Republic for a film with Marian Marsh. Then it was Girls on Probation (1938) for Warner Brothers. The film co-starred Ronald Reagan and was notable as Susan Hayward’s first film. In mid-1938, Peggy and a female companion were involved in a car accident with another driver receiving lacerations on her nose and cuts on her legs. It was rumored that alcohol was involved. Friends in the business tried to help giving her small roles but in some cases her drinking would get in the way. One of her last films was Café Hostess (1940) for Columbia. In 1940, Peggy decided to end her fourteen year marriage to Alan Davis. She declared that he struck her on one occasion at the home of actress Wynne Gibson, who testified for her friend that he struck her “over something very inconsequential.” She added that because of her husband’s disinclination to work she had to support him as well as herself during their marriage. “He was just lazy—he played all the time,” she told the judge. Several months later, in October 1940, Peggy married cameraman, Albert “Al” Roberts in Mexico. 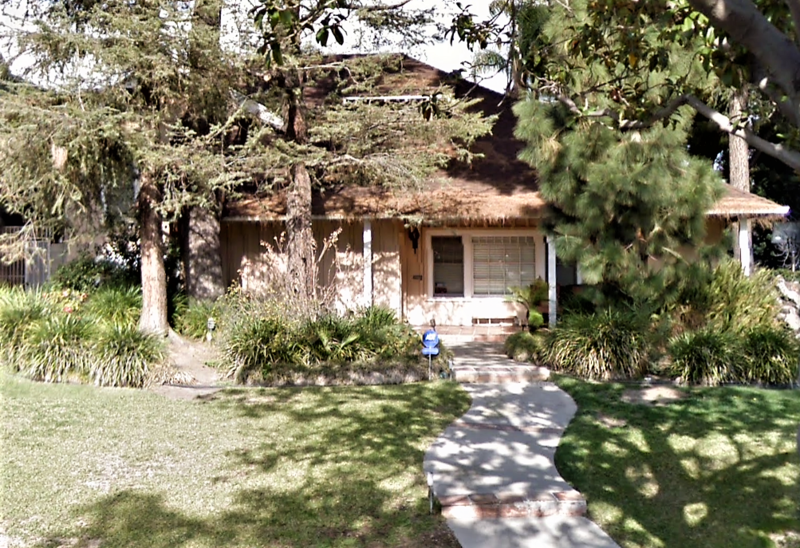 They set up housekeeping at 4318 Irvine Street in North Hollywood, along with their German Sheppard, Spec. By now, Peggy was forgotten by the studios and seldom received offers, causing her to drink even more. 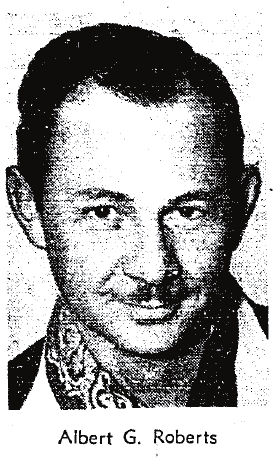 In early May 1941, Roberts and his friend Elmer Fryer left for a few days on a fishing trip. When they returned on Sunday, May 11, Roberts found Peggy slumped dead across the kitchen table with her head on her arms; she was barefoot and clad in a sun suit. A cigarette, burned to the tip of her fingers, was in her right hand. Three glasses and a soft-drink bottle found in the sink were turned over to the Coroner to check for traces of poison. Peggy Shannon was 31. 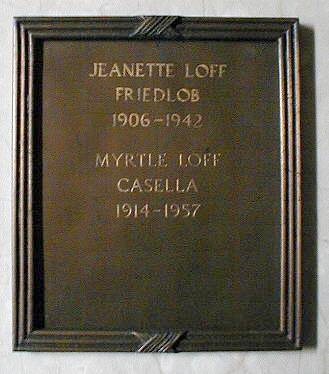 She was laid to rest at Hollywood Cemetery a few days later without much fanfare. Roberts was devastated by Peggy’s death. He was afraid that someone might think he had something to do with her death. In a conversation with Detective William Burris, Roberts said, “Bill, you’ve got something on your mind. 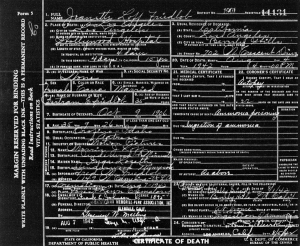 You don’t suspect me of Peggy’s death do you?” Burris assured him that was not the case and he was merely awaiting the report of the autopsy. Three weeks after Peggy’s death, in the early morning hours of Memorial Day, May 30, 1941, Roberts took Spec to visit Peggy’s grave at Hollywood Cemetery. 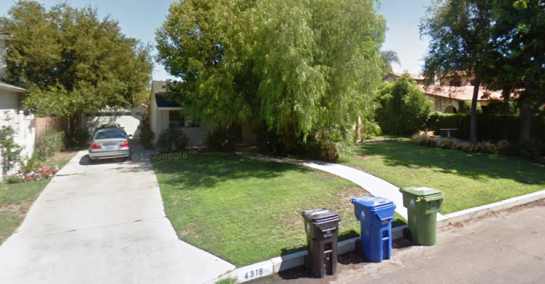 Afterward he returned to his home on Irvine Street and wrote three notes: one to ‘those concerned’ and two to his sister Phoebe, who lived in Glendale. At about dawn he called his sister and said he was going to kill himself. “Al, don’t do it,” she screamed into the phone. Suddenly she heard a shot and then, the barking of the dog. When police reached the house, Roberts was dead. A rifle was found near the body. In one hand he still grasped the telephone receiver. His body rested on the same chair where he had found Peggy’s body; like her, his head had fallen forward on the table. Two empty liquor bottles and two soft drink bottles were on the table. Nearby Spec lay whimpering. actress Peggy Shannon died and her husband, Albert Roberts committed suicide. In a second note to his sister, Roberts expressed concern for his dog, Spec. Ironically, Albert Roberts’s body was not laid next to Peggy’s, but was buried at Forest Lawn Cemetery in Glendale. Whether it was the decision of his family or Peggy’s to not have them be together, is not known. A few weeks after Peggy’s death, her mother hired private detectives and attorneys to investigate deeper into her daughter’s death. Nothing apparently came of their search. Peggy Shannon’s grave at Hollywood Forever is near the southern border of Section 5 in plot 31, grave 4. 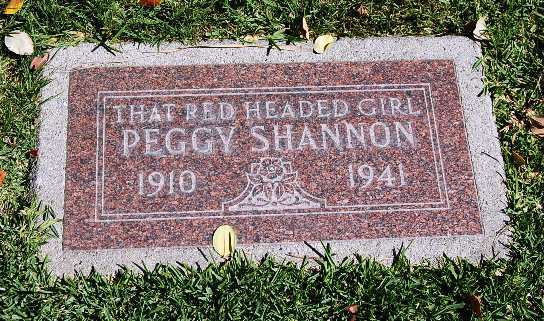 Her pink tombstone is inscribed “That Red-Headed Girl, Peggy Shannon.” Her mother and sister are buried nearby. Late last night emergency personnel were called to Forest Lawn Cemetery in Glendale where loud noises, banging and crying were heard emanating from the Sanctuary of Benediction corridor of the Great Mausoleum. After a brief investigation, workmen discovered the sounds were coming from the crypt of Sid Grauman, the builder of Hollywood’s Egyptian and Chinese Theatres. Evidently the great showman was turning over in his grave after the cast of the X-Factor–Simon Cowell, Britney Spears, L.A. Reid and Demi Lovato, left their handprints in cement at the forecourt of the legendary Chinese Theater. This once honored Hollywood tradition, which in the past has been reserved for the greats of film history (need it be mentioned the film hits of Cowell, Spears, Reid & Lovato?? ), last night was finally put out of its misery. While choices in the recent past have been questionable, one can only wonder who is next–the Kardashians? Rest in peace, Sid Grauman. Where is Claire Windsor – Update! “Greetings from Cawker City, Kansas; home town of Claire Windsor and the World’s Largest Ball of Twine! In later years, Claire confessed that Lois Weber had hatched the plan for Claire’s disappearance to get a little publicity for her upcoming film. Poor Chaplin was not let in on the secret and it spoiled Claire and Charlie’s personal relationship. Little Billy Windsor, Claire’s only son, learned well from the experience and later, in an effort to get his mother’s attenetion, fabricated a story that men had come to the front door of thier house and tried to kidnap him! Claire Windsor, a Kansas-born music student who came to Hollywood to seek her fortune, was pulled out of the ranks of extras by director Lois Weber, who was casting To Please One Woman (1920) and offered her a role. An immediate success, the blonde actress became one of the busiest and best-known performers in Hollywood. In the summer of 1921, with only four films in release in the previous six months, Windsor was enjoying her new found success as a leading lady. On Tuesday, July 12, during filming of The Blot, also directed by Weber, Windsor took a deserved day off to go horseback riding in the Hollywood hills. Early that morning she rented a horse and headed alone through the Cahuenga Pass. 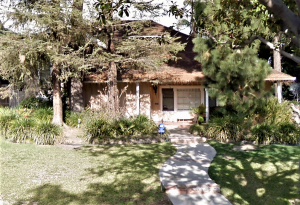 When Windsor did not turn up at home (1042 Third Avenue) that evening, family members called the Hollywood police, who employed an airplane to search the hills the following morning. A group of Boy Scouts who were camping in the hills also aided in the search as did many of her friends. Charlie Chaplin offered a reward leading to her location. By eight o’clock on Wednesday evening, Windsor had been missing for 36 hours when Stella Dodge, who lived at the intersection of Highland and Cahuenga (now part of the Hollywood Freeway), heard moans outside her home. She investigated and found Windsor lying on the lawn underneath her window. Dodge helped Windsor into her house and called Dr. C.W. Cook and the Hollywood police. An ambulance arrived and took her to Angelus Hospital at 1925 S. Trinity Street (demolished). When found, she was wearing her riding habit, which was badly torn by thorns, and she still had on her riding gloves. A thorough examination at the hospital revealed the only external injury was an abrasion on the back of her left ear and exposure and hunger due to her long isolation in the hills. Her nose was bleeding which suggested possible internal injuries. Her pulse was low and she was unable to speak until the following morning. It was Dr. Cook’s opinion that Windsor was thrown from her horse, suffering an injury to the back of her head, and had wandered about in the Hollywood hills until she was found semiconscious. Chaplin and other film friends rushed to the hospital once it was learned she was found. Of course, Windsor recuperated and continued a long career that spanned three decades, 50 silent films and seven talkies. Claire Windsor died at age 80 from a heart attack on October 23, 1972 at Good Samaritan Hospital. 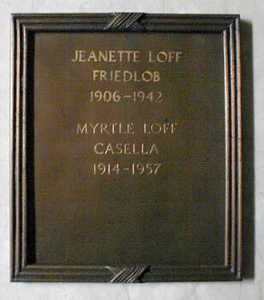 She is buried at Forest Lawn Memorial Park in Glendale. THE MYSTERY OF LIFE monument as it looks today. The above description must have been before they installed the reproduction of Michelangelo’s “David” in the courtyard adjoining this garden. 3 and 4. – the lovers, who believe they have found the answer to the mystery in their first kiss. 5. – the sweet girl graduate, lost in dreams, with no place as yet in her thoughts for a serious questioning of Life’s destiny. 6. – the scientist, troubled because all his learnings, all his searchings, have not solved the mystery. 7 and 8. – the mother, who finds the answer in the babe at her breast. 14. the learned philosopher, scratching his puzzled head in vain. 15 and 16. – the monk and the nun, comforted and secure, confident that they have found the answer in their religion. 18. – the stoic, sits in silent awe and comtemplation of that which he believes he knows but cannot explain or understand. And, to the left of this sculpture is a private garden containing the earthly remains of Mary Pickford (1893-1979), Warner Baxter (1891-1951), Humphrey Bogart (1899-1957), evangelist Kathryn Kuhlman (1907-1976), Earl Carrol (1893-1948) and his girlfriend Beryl Wallace (1910-1948) and Joan Crawford’s ‘Mommie Dearest’ — Anna Le Sueur (1884-1958).